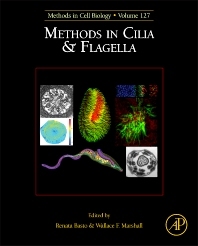 The goal of this book is to collect methods and protocols for studying cilia in a wide range of different cell types, so that researchers from many fields of biology can start exploring the role of cilia in their own system. Wallace Marshall is an electrical engineer by training, who became interested in biology out of a desire to understand how cells solve engineering problems, such as determining the size of organelles. He received his Ph.D. at UCSF with John Sedat, where he studied the diffusional of motion of interphase chromatin using live cell imaging and computational image analysis. He then trained as a postdoc with Joel Rosenbaum at Yale, where he began studying the mechanisms regulating the length of cilia and flagella. He is now Profess of Biochemistry at UCSF, where he lab continues to study the assembly and length regulation of cilia and flagella, as well as the mechanisms that regulate the size of other organelles. His work takes advantage of an integrated combination of methods including genetics, microscopy, and computational modeling, as well as a wide variety of model organisms including Chlamydomonas reinhardtii, Stentor coeruleus, yeast, flatworms, and mammalian cells.